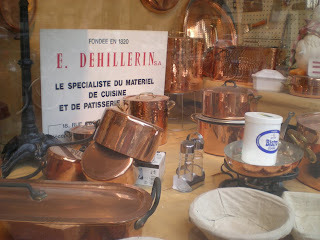 On my layover in Paris this past week, I decided to follow in Julia Child's footsteps around Paris. 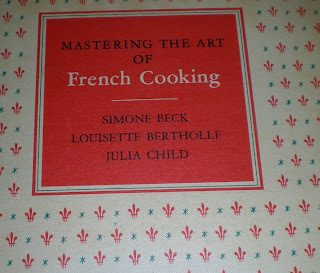 I had read My Life in France, Julia's autobiography about her adventures in Europe and how she started writing Mastering the Art of French Cooking. And I wanted to see the area where she lived, where she shopped and where she ate! This website was very helpful by giving me the addresses for some of the Restaurants where Julia and her husband Paul would sample French cuisine. Unfortunately this link no longer works. 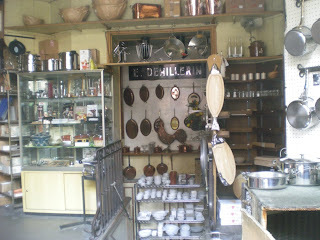 My first stop was E. Dehillerin, the store where Julia bought her pots and pans and other cooking paraphernalia. 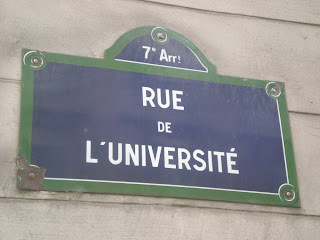 It is located at 18-20 rue Coquilliere near the Les Halles metro stop. 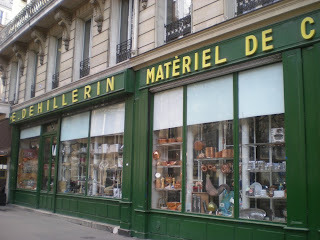 Next I took the Metro to St. Germain des Pres, were two restaurants that Julia used to go to are located. Les Deux Magots and just across the street, Brasserie Lipp. Les Deux Magots sounds like a questionable name for a restaurant, but it translates as,'two nest eggs'. 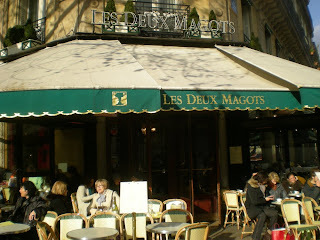 It took its name 'Les Deux Magots' from a play, 'The Two Magots of China' that was popular at the time. Two wooden statues of Chinese mandarins decorate the interior of the restaurant. 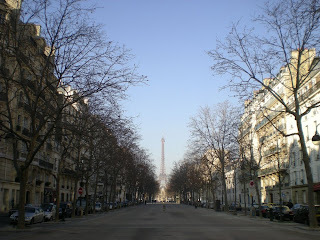 This is where Julia and Paul went on their first Saturday in Paris and ordered café complet. 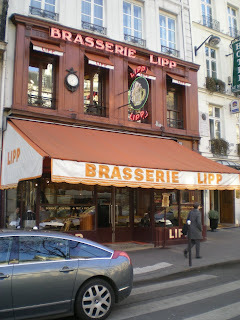 Supposedly they would eat oysters across the street at Brasserie Lipp. (Johnny Depp was recently spotted at Lipp, so it is still a happening joint). 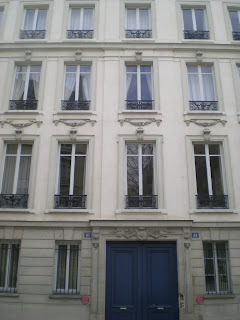 Next I walked along the rue de l'Universite (or "Roo de Loo" as Julia and Paul called it) where they had an apartment at number 81. 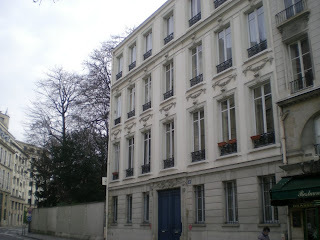 Julia and her husband, Paul, lived in the top two floors of this building. Julia's kitchen was on the third floor, connected to the dining room by a dumb-waiter, and it was dominated by an immense stove that required five tons of coal to heat. On top of this was a little two-burner hot plate type thing and a box-oven that could barely warm plates. A huge sink that had no hot water and its pipes would freeze in the winter, and no garbage bins made this a challenging kitchen to cook in. 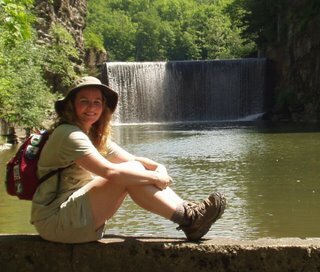 She made the best of a bad situation, by setting a tub of water over a gas flame, buying garbage cans, and hanging up a can-opener on the wall. My last stop of the day was at La Closerie des Lilas, a restaurant near the Vavin Metro stop. 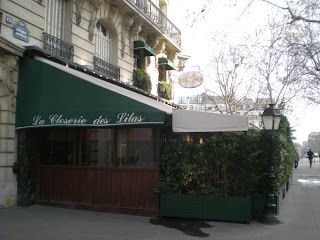 A favorite haunt of Hemingway, Gertrude Stein and Henry Miller and many, many other artists and writers, the Closerie des Lilas in Montparnasse is a good place to stop for a drink, Julia and Paul would have sandwiches and beer here. Be sure to notice the copper plaques with the names of the famous people who have frequented the Closerie over the years. You can even sit at Hemingway's favorite bar stool!